The thing I appreciate about Singles Club is being introduced to an artist through not just a single, the way that I discovered new music pre-internet, but with a digital zine and an interview with the artist on the B-Side. The articles are sprawling and really nicely put together that give you a complete picture of, in this case Small Sur and the track on the record itself. The artifact doesn't mean a thing without that personal connection. Sometimes a complete mystery can be a powerful thing for record you found in the dollar bin but the picture that Joseph F Conway paints describing Bob Keal and his dog Goose is going to become a part of the record. That's what I've tried to do with 7inches; tell that story about the music and something about the band which is the only way to make that tiny piece of plastic worth paying attention to. 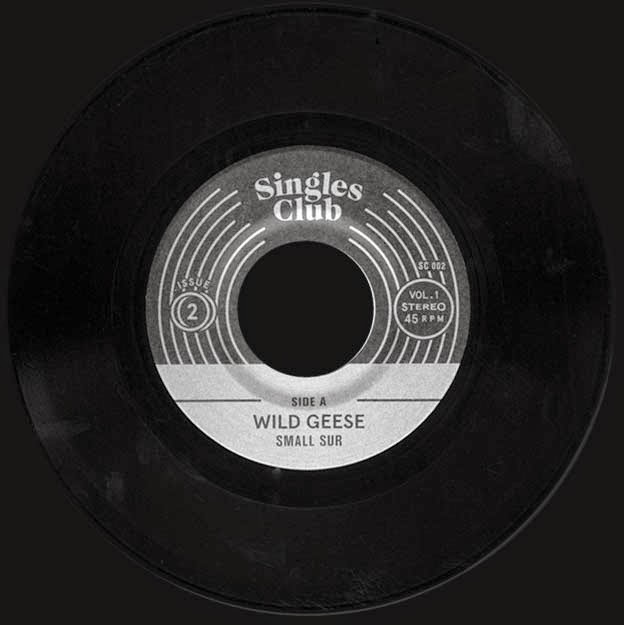 A-Side's "Wild Geese" opens with rising sustained guitar tones, overlapping in harmony and the thing that makes this interesting right away is in the rhythm; Small Sur creates this strummed rolling tide feel, perfect for a summer evening by the way, the kind of thing that is cleanly produced with this crisp edge emphasized by an organ and backwards rounded envelopes. His vocal is strong and in front of this. Powerful narrative stuff like Song: Ohia or Band of Horses; a laid back powerful epic performance is at work. Changing hearts and minds with a single side it manages to become bigger and bigger while not raising it's voice essentially. Lots of lyrics about natural things reminding me of The Bowerbirds with a bit of Sufjan's Age of Adz production. A masterful touch on the engineering side, perfectly balanced floors slide in and he rides this wave forever, it creeps in not really breaking moving towards shore to simply lose speed and settle back underwater but it was huge, unrideable and no one is going to believe you. Subscriptions still available from the Singles Club. Check out Issue 2 and listen to Wild Geese over here.